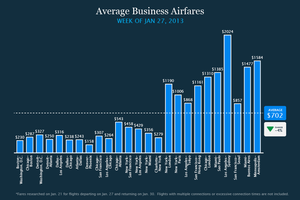 There's one happy trend continuing this week, as business travel continues to cost less. But from there, expect your wallet to take a bigger hit than usual. That's the big takeaway from this week of the Murphy Travel Index. Chicago to the West Coast is a route to find some bargains for biz travelers, while a large amount of leisure route prices were unchanged. 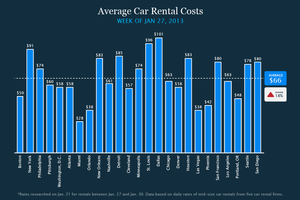 Car rentals are the high-price trend leader this week, as prices are way up. 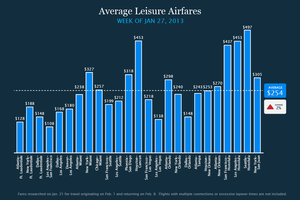 To be clear: Our numbers are based on research done last week looking for fares and rates for the Jan. 27-30 window, except for leisure airfare, which was researched for the week of Feb. 1-8. - Great fares abound for those who decide to vacation when everyone else is back at work or in school. - Although ticket prices inched up this week (up 2 percent), there are still some great deals in the air before the February vacation season gets into full swing. 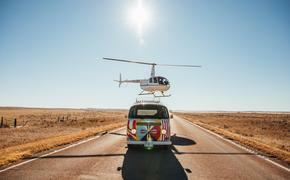 - Prices remain unchanged this week on nearly half the routes in our survey, but rose sharply on several routes including Los Angeles to Las Vegas, where the price of a ticket nearly doubled. - Prices are also more expensive on flights from Miami to Atlanta (up 20 percent) and New York (up 24 percent), and on flights between Seattle and San Francisco (up 17 percent). - Spirit is once again the low-price leader in our survey this week, with lowest prices on six of our 25 routes surveyed. U.S. Airways and United are tied for second, with four lowest-prices routes each. - There’s still time to ticket awards using United’s Mileage Plus more generous award chart. 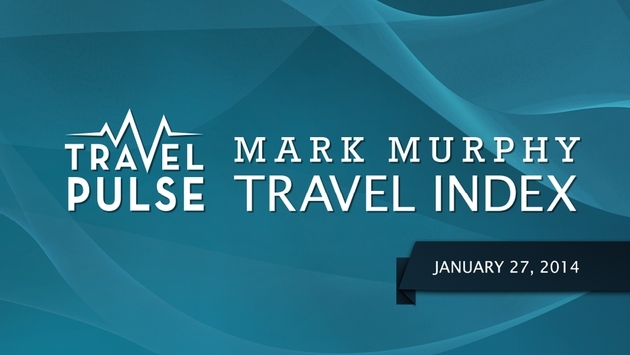 Members have until January 31 to book award travel under the current chart. On Feb. 1, United will raise the mileage level for many popular awards, and the mileage needed to claim an award on partner airlines will increase substantially. - Ticket prices are down 4 percent this week and fares overall are down for the fifth straight week, as fares return to the levels recorded in November and early December. - Low fare carrier Spirit Airlines continues to offer low fare seats during peak weekday travel times, and larger carriers are also dropping prices as seats open up during the slowest period of the year for airline travel. - Fares are down sharply on flights from Chicago to the West Coast, and on travel between Dallas and Los Angeles (down 17 percent from last week) and Atlanta (down 55 percent). - Ticket prices are up this week on flights from Boston to Washington (up 26 percent) and Chicago (up 11 percent). - A lot of price parity this week, as U.S. Airways has lowest prices on five of our 25 routes, followed by four from Frontier and three from Spirit. - Over at American Express, Membership Rewards participants can take advantage of a 40 percent transfer bonus to switch AmEx points into Virgin America’s frequent flier program. Two hundred Membership Rewards points will convert to 140 Virgin miles. The offer is available through Jan. 31. - JetBlue members who purchase and flight seven round¬trip flights on the airline during a calendar year will earn 7,000 TrueBlue points. - Prices inched up for leisure fares after four straight weeks of flat or decreasing prices while business fares continue dropping. - For leisure, prices are up $5 on average this week, but are still more than half off the prices around Christmas. 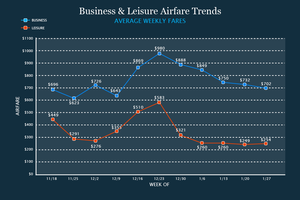 - Business fares are down once again, dropping $30 on average this week. It's the fifth straight week of price drops, and $278 lower on average than the high in our surveying the week of Dec. 23, 2013. - Air fares may have leveled off in recent weeks, but hotel rooms are getting more expensive. Rates are up 4 percent from last week, and occupancy is tight in several cities including Los Angeles, Miami, Washington, D.C. and Phoenix. - In the aftermath of the Grammy Awards, L.A. is playing host to conferences for professionals in lodging investments, foundation management and landscaping. - Phoenix is a home away from home to manufacturing executives and healthcare payment professionals. Orlando is the site for IBM software and eHealth conferences, while Chicago welcomes members of the International Ticketing Association. - Miami is crowded and expensive this week, thanks to a huge B2B video production networking event and several get togethers for finance executives. - Super Prices: Not surprisingly, many hotels in New York City are sold out for Super Bowl weekend. But those who do manage to score a room will pay a huge premium: a room at the Holiday Inn Express in Times Square typically costs less than $200 per night, but the hotel is charging over $700 for a room on Feb. 1. - It’s the same story over at the Holiday Inn at Madison Square Garden, where guests can expect to pay more than $600 for a room on Saturday night. Rates will return to earth once the Broncos and the Seahawks settle their differences. - Expect to pay top dollar for car rentals this week. - Prices exceed $90 per day in New York, St. Louis and Dallas, and prices are up sharply in most cities including San Diego (up 116 percent from last week), Houston (up 113 percent), Minneapolis (up 40 percent), Portland (up 55 percent) and Atlanta (up 38 percent). - Consolidation in the industry has resulted in fewer choices for travelers, and the top names in the industry can sometimes charge twice as much as their lesser known counterparts. The price swing for a daily rate can be static or dramatic: in Atlanta, the daily rate for a mid¬sized car rental can cost as little as $13 (Payless) or as much as $105 (Hertz). - The situation is reversed in New Orleans, with prices at the five major rental companies ranging between $83 and $89 per day. 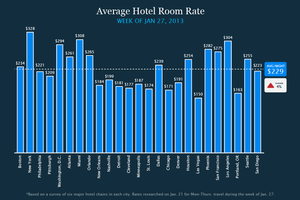 - After a one-week decline in prices, hotels are up again this week, up $8 on average. 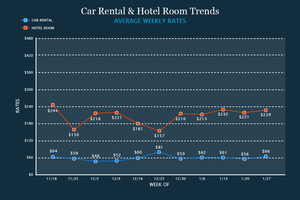 - Car rentals are up $10 on average this week, the second-highest one-week jump since we began the survey in November. This is the highest non-holiday weekly average ($66) in our 11 weeks of surveying. One last note: Visitors to Seattle may want to check out the “Block by Block” exhibit at the city’s Norton Museum of Art, featuring 10 landmark buildings from around the world made entirely of Legos.